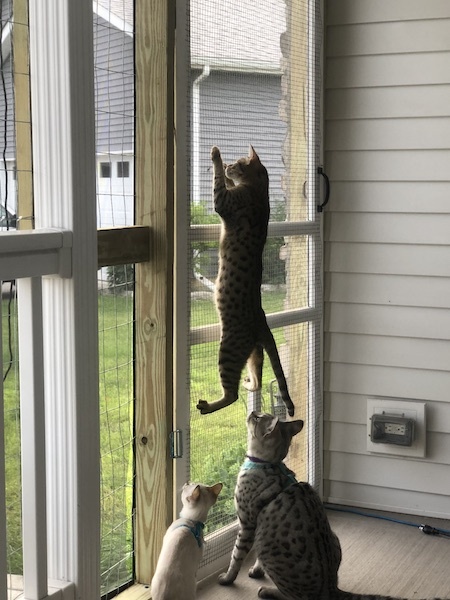 A1 Savannahs is a superb Savannah/Serval cattery! I knew very little about Savannah's when I began communication with Martin and Amanda. Their knowledge was invaluable! I learned as much as I could from them and continue to learn every day from my awesome, adventuresome, AMAZING 5 kids! (all Savannah's!) They are truly a one of a kind feline creation! I adopted my F6 Heidi Amanda Olga (after her breeder Amanda Engster and the breeder of my 2 F2 Males, Hans and Heinrick. I flew out to Ponca City, OK and had an amazing visit with both Amanda and Martin. Even got to meet their adolescent Serval, Loki! Heidi was very well adjusted to both humans and other felines, adults as well as kittens! I adopted her at 14 weeks. She made the trip home (two flights and 2 hour plus car rides) like a trooper! She even went to an AA meeting an hour after I picked her up! She was the talk of the meeting, not to mention the cutest one in the room! lol! She now resides in my home with her 3 F2 and F4 brothers as well as her F3 sister Hermoine! She is extremely playful and loves to cuddle with me as well as the others! She holds her own when it comes to wrestling and is also extremely friendly to any visitors. She snuggles in with me at night, under the covers or fighting for a spot next to or on top of me. All 7 (I have 2 domestic shorthairs as well) sleep with me every night in my King size bed! She's a great big sister to both Hermoine (1 day younger F3 melanistic) and Hamilton, F4 Snow Lynx). She snuggles with both of them and grooms them as well! Not to mention wrestling!! 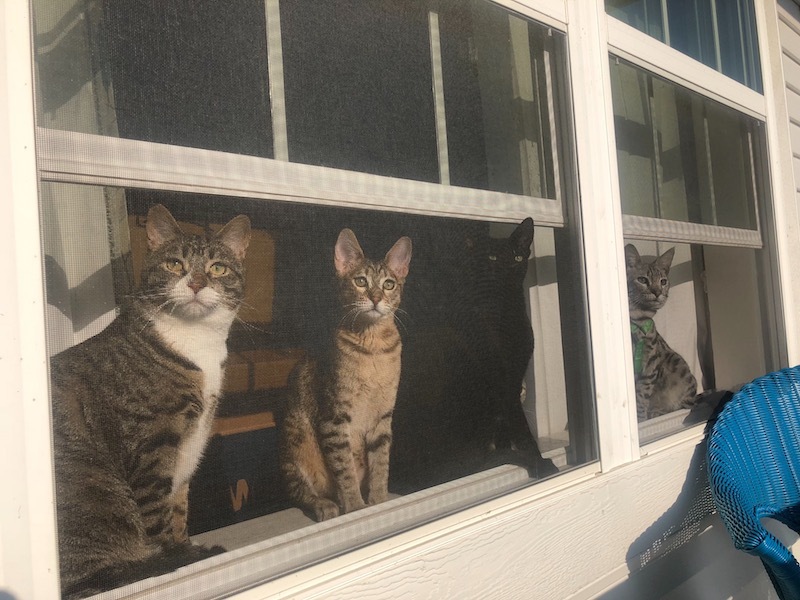 Myself and 4 of the cats (Hans, Heidi, Hamilton and Heather-DSH) are in training to become a certified Pet Therapy team through Pet Partners. We will then be able to visit Children's hospitals and nursing homes as well as Alhzheimers units. I hope to some day be able to visit grade schools as well! You’ll see a video attached (or a photo) of Heidi meeting Hans for the first time. One day and absolutely no hissing from either one! I was blown away!! I can't recommend A1Savannah's enough not to mention Amanda and Martin Engster! They are so good that we have actually remained friends and hopefully sometime in the near future I will be taking a road trip on my Honda GoldWing with Heidi on my back in a SAFE pet backpack carrier!! Way to GO A1 Savannah's! You're TOP NOTCH!